*Now with Light Division, National Physical Laboratory, Teddington, England. During work on the primary standard of light a photometer has been developed which possesses desirable qualities. The detector used is a Gillod-Boutry vacuum photocell with cesium-bismuth cathode surface having a basic sensitivity of 25 μA/lu. The photocurrent is measured by a simple circuit, using balanced electrometer tubes, similar to circuits which have been described frequently over a long period of time in the literature [e.g., C. H. Sharp and H. A. Smith, Trans. 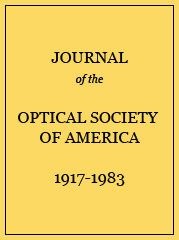 IES 23, 434 ( 1928), and O. C. Jones, R. S. Maddever, and J. H. Sanders, J. Sci. Instr. 36, 24 ( 1959)] except in one rather important respect which is described fully. The photometer is compact and portable. Battery replacement is only necessary every three months. Differences between successive readings and zeros repeat to ±2/104 when measuring a steady incidence of 10−4 lu. Zero drift is small, necessitating readings only every 15 min. Circuit stability is good, so that the simple balance adjustment need not be used more than twice daily, provided that the triodes are suitably matched. Due to undetermined causes day-to-day variations in sensitivity of 0.5% sometimes occur.